Is sub-Saharan Africa ready for the electric vehicle revolution? When Francis Romano imported his first electric vehicle, a Nissan Leaf, into Kenya in 2016, it was held up at the port because customs officials had never seen one before. Since the car didn’t have an internal combustion engine, they didn’t know what to make of it. But things are changing fast. When Romano imported more electric vehicles to test their performance in the Kenyan market, he found he could run his entire business without petrol, saving up to 70% a year on fuel. Africa is urbanizing faster than any other continent, at a rate of 4% every year, compared to the global average of 2%. Its rapidly growing urban population continues to strain existing infrastructure - transport and energy, in particular. Firstly, sub-Saharan Africa’s transport is almost entirely fuel-based. This creates a cost burden for citizens and a fiscal burden for countries. In Nairobi, residents spend 14-30% of their income on transport. To protect consumers from ever increasing fuel prices, African governments heavily subsidize fuels, at an average cost of 1.4% GDP. However, these subsidies disproportionately benefit higher-income households. As cities expand, oil demand grows and the problems of fuel scarcity and cost loom larger. Pollution from fuel-based transport is also a major contributor to growing air quality concerns in African cities. Secondly, demand for electricity in Africa is increasing rapidly. 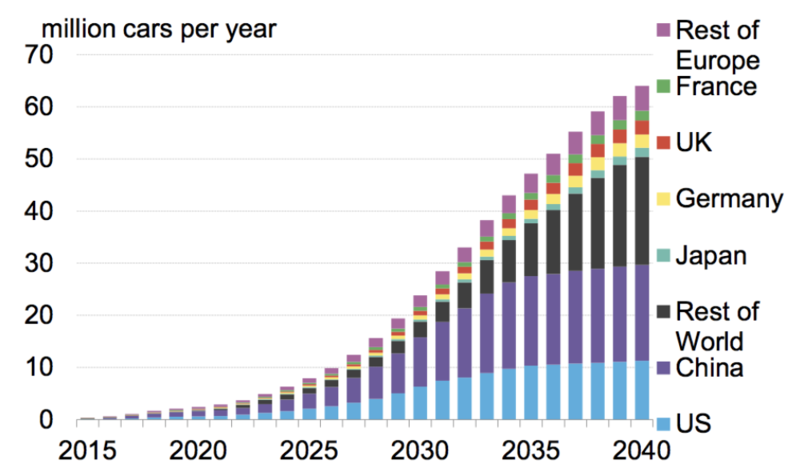 It is anticipated to quadruple by 2040. It is often overlooked that many African countries already rely on low-carbon technologies such as geothermal energy and hydropower. In 2017, 77% of Kenya’s electricity demand was met through renewable energy. Many African countries are looking to low-cost renewables with abundant potential, such as solar and wind, to grow grid capacity. One critical challenge is that these sources are inherently variable (or "intermittent") and often do not coincide with times of highest electricity demand from consumers. Energy storage that allows electricity to be saved and used at different times of day is a key component for ensuring the viability of renewables in Africa. This is where electric vehicles (EVs) come in. Sub-Saharan African (SSA) countries urgently need a transport alternative to stave off the growing burden of fuel dependency and subsidies, as well as an electricity storage solution to leverage their abundant renewable energy resources. EVs, powered by electricity and running on battery storage, offer a potential solution to both these problems. Furthermore, as EVs produce no direct emissions through the exhaust pipe, they can improve the air quality of Africa’s congested cities. Internationally, the EV market is already growing at exponential rates, with more than 3 million vehicles sold globally. Every major automobile manufacturer now has hybrid and full plug-in EVs in commercial production. By 2040, 54% of new global car sales and 33% of the world’s car fleet will be electric, according to experts. China and India - the world’s largest and fifth-largest automobile markets, respectively - are great examples of what is possible in emerging markets with the right policy interventions. Both aim to switch to EVs to improve their energy security, reducing long-term dependency on imported oil (in 2016, this stood at around 66% of crude oil consumption in China and 80% in India). Another key driver for their adoption of EVs has been both countries' rapidly worsening urban air quality. India is seeking a completely electrified vehicle fleet by 2030. China’s government anticipates that 'New Energy Vehicles' (NEVs) will reach 5% of total vehicle market demand by 2020 and 20% by 2025. Both countries are implementing policies and subsidies to realise these goals. The Chinese government has already spent $3 billion on promoting EVs. This is the perfect time for African countries to explore the potential of EVs. Many SSA countries will be making large investments in power capacity in the next decade. Vehicle ownership will rise dramatically over that period, given population growth, increased urbanization and a rising middle class. SSA countries have the opportunity to pursue an energy-secure and lower-cost path, taking advantage of the strong global EV trend, before locking themselves into greater dependency on imported fuel and a carbon-intensive energy grid. That said, there are challenges that affect the industry globally, as well as obstacles specific to SSA countries. Global issues include the need for significant infrastructure investments (such as dedicated charging stations), grid integration and planning requirements, as well as change in consumer attitudes and behaviour. The unique challenges to viability in the SSA region are exemplified by the recent debate around electrifying Kenya’s new rail system. Firstly, a large EV fleet would require a reliable power supply and reasonably low electricity prices, both of which could be an issue in SSA countries. Electricity blackouts occur on a daily basis in 30 out of the 48 countries, and electricity prices can be more than double those in the US and China. There is also the environmental issue of battery manufacture and disposal, which could be more challenging in SSA due to often relatively informal waste management systems. Lastly, international examples demonstrate that rapid EV adoption requires strong enabling policies, including tax incentives and subsidies, which is tricky given many competing priorities for limited government funding in SSA. So, what next? There are unique conditions in SSA that indicate EVs could help solve two fundamental infrastructure challenges, around transport and energy. There are also big question marks around viability and relevance. One thing is clear: this topic warrants further study. There is essentially no data or research on EV potential in SSA. The two major annual EV publications (International Energy Agency and Bloomberg New Energy Finance) do not feature any data specific to Africa. There should be dedicated and objective policy analysis by domestic energy and transport ministries, as well as an increased effort to integrate Africa into international EV research. We know that Africans will continue to experiment and push boundaries. When Romano drives his Nissan Leaf around Nairobi, he is constantly stopped and asked questions by curious passers-by. "Does the vehicle have an exhaust pipe?" "Can I get up-country to visit my family on one charge?" "Will I get electrocuted if I drive in water?" 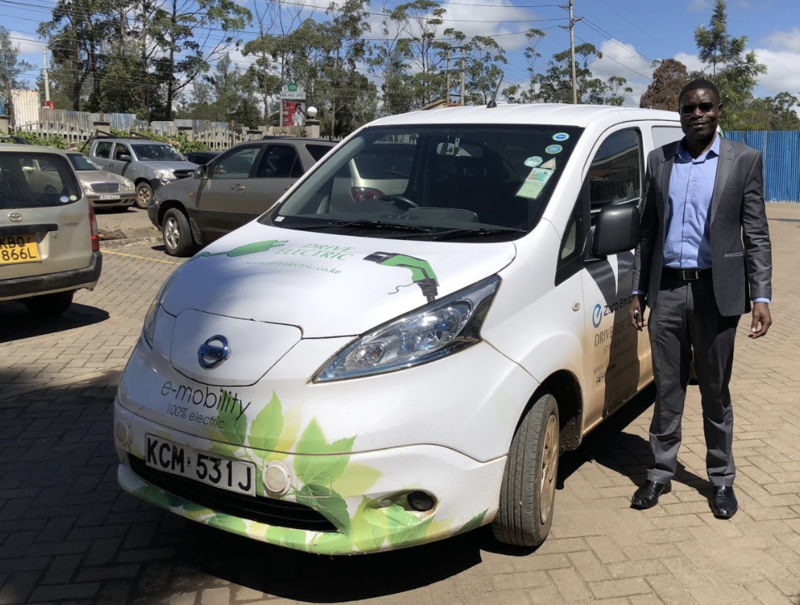 Expect to see more EVs on the streets of Nairobi and across the continent, as Romano and other first-movers continue to break ground, until policy-makers follow suit.